As I was strolling through the Davis Art Images archives (don’t roll your eyes, a lot of us art historians have museums of images in our head), I happened by chance upon this lovely, delicate portrait of Charles Willson Peale (1741-1827), one of my favorite Early American Masters. Silhouettes are a fascinating and extraordinary art form that flourished starting in the mid- to late-eighteenth century. As a boy (yes, I remember that far back) I visited President Lincoln’s home in Springfield, Illinois, and there were many silhouettes of his family decorating the wall – that fascinated me. I was further enthralled with the art form when I witnessed, shortly thereafter in a tourist shop in Springfield, an artist producing silhouettes of visitors – with a pair of manicure scissors!!! Again, this is one of those artistic disciplines, like miniature portraits, that amazes me. The origins of silhouette go back to classical antiquity. It emerged as a popular art form in Europe during the seventeenth century, but the heyday of silhouette was the mid-eighteenth to mid-nineteenth centuries in both Europe and America. It was not only a profitable profession for skilled artists, but was also a fashionable pastime for upper and middle-class people. The art form itself is named after a French finance minister, Etienne de Silhouette (1709-1767), who cut silhouettes as a hobby (and, some argue, because of the frugality of his fiscal policies). Traditionally, silhouettes were cut from paper that was white on one side (allowing for a drawing if the artist did so) and black on the other. Variations of the genre were painted silhouettes on paper or ivory, or reverse painting on glass. Silhouette cutting flourishes as an art form to this day. One of the most famous contemporary artists doing work with silhouettes is Kara Walker. William James Hubard was a child prodigy who grew up in Norwich, England. At the age of twelve he had mastered and achieved acclaim as a cutter of silhouettes, and by the age of seventeen he was hailed as a master of the art form. 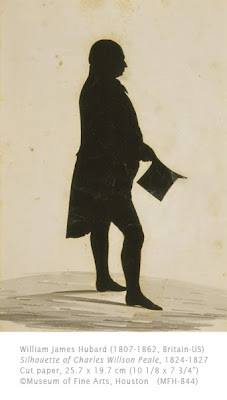 By the age of 20, after three years of cutting silhouettes in Boston, New York, and Philadelphia (the period when he did Peale’s silhouette), Hubard set up the Hubard Gallery in New York where he charged 50 cents per cutting. He often stamped the back of his silhouettes “Cut with scissors by Master Hubard without drawing.” Between 1828 and the 1830s Hubard traveled to the South and produced silhouettes of many southern luminaries including Andrew Jackson and John Calhoun. In 1832, it is believed that the famous American painter Gilbert Stuart (1755-1828) persuaded Hubard to begin painting portraits in oil. With the help of another famous Early American Master, Thomas Sully (1783-1872), Hubard set up a painting studio in New York. For the rest of his career he produced primarily oil paintings, and even some sculpted portraits, although his studio still advertised silhouettes (though by this point they were produced by assistants). His most famous painted portrait is of John Marshall, Chief Justice of the Supreme Court, and the longest serving Supreme Court justice in history. A really fascinating silhouette by a French artist at the PMA. And, lest we believe that this is strictly a western subject matter, silhouettes are also a popular subject in Japanese art.